Remember when fighting games weren’t consisting of polygons, or 3-D backgrounds, or, in some cases, even online play? Remember when all you needed was a good hand-drawn character, a memorable stage or a simple move set to conquer your opponent? Well, so do we. So we here at Gameplaybook took it upon ourselves to count down our top ten favorite 2-D fighting games of all time. Now, there are some rules we abide by. While Street Fighter IV could be considered with its 2-D-style gameplay, we ruled it out because it had 3-D visuals. We also counted out Marvel Vs. Capcom 2 for its 3-D backgrounds, though it broke out heart to not include that game. It has to be strictly 2-D, even if there are zoom-in zoom-out effects and multi-plane jumping. As long as it stays in the second dimension, we counted it. So here we go, our ten favorites! And if you disagree with our selections, hey, let us know. We appreciate your opinions! SNK made a mess of great fighting games in the era of the Neo-Geo console and arcade system, and among them was the ninth and final game in the Fatal Fury era, Mark of the Wolves. Featuring a mostly new cast (save for Geese Howard’s son Rock and a returning, older Terry Bogard), the game features fresh 2-D gameplay, topped off with a new Tactical Offense Position set-up, along with the most detailed animation we’ve seen in a Neo-Geo brawler. This one’s available on Xbox Live now, with online play. We highly recommend checking it out, even if you’re caught up in today’s more current fighters. It’s worth your time. 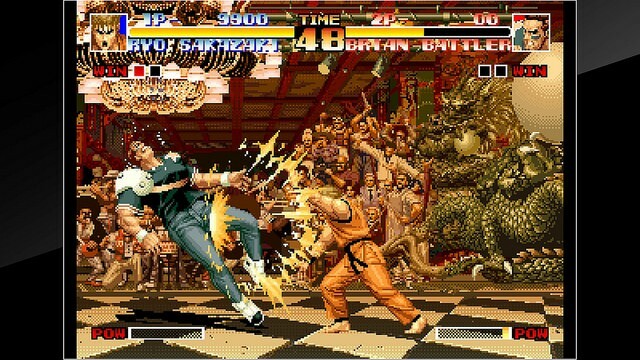 Many believe that the fighting genre got its start in 1989 when Capcom released the original Street Fighter into arcades. But, surprise, Data East actually led the drive way back in 1984 with Karate Champ. This game doesn’t follow traditional fighting rules, but its dual joystick control set-up was innovative at the time, and two-player matches were filled with just as much strategy as a good round in a Street Fighter game. Plus, the bonus rounds – involving flying objects and a charging bull – were a lot of fun. Revolutionary Concepts recently re-released this game for iPhone and iPad, and for the $1.99 asking price, it’s great. Many awesome King of Fighters games came out over the years, bringing the best in SNK’s fighting universe together for one explosive fight after another. King of Fighters ’94, however, was a real high point for us. It features a variety of fighters from many classic and current SNK releases, including characters from Psycho Soldier, Art of Fighting and even the arcade/NES classic Ikari Warriors. The gameplay is still very polished to this day, and the presentation can’t be beat. If you spot it in a local arcade, give it a go. And bring a friend with you. Fighting games are always better with a buddy. We were THIS close to naming the original Marvel Vs. Capcom over X-Men Vs. Street Fighter, but between nostalgia and playing the arcade-perfect port on the Sega Saturn, the first crossover game managed to win out — by a freakin’ hair, folks. XMVSF’s tag-team tactic is just part of the fun, as you’ll mash up in battles between Capcom’s elite Street Fighter roster and Marvel’s coolest superheroes (and villains). This one paved the way for many great crossover games over the years, with more coming between Marvel Vs. Capcom 3 and Street Fighter x Tekken in 2011 and 2012, respectively. Long live versus games! We said it before, and we’ll say it again. Capcom, you need to give this game a high-definition makeover and release it for Xbox Live and PlayStation Network. You’d make a killing! 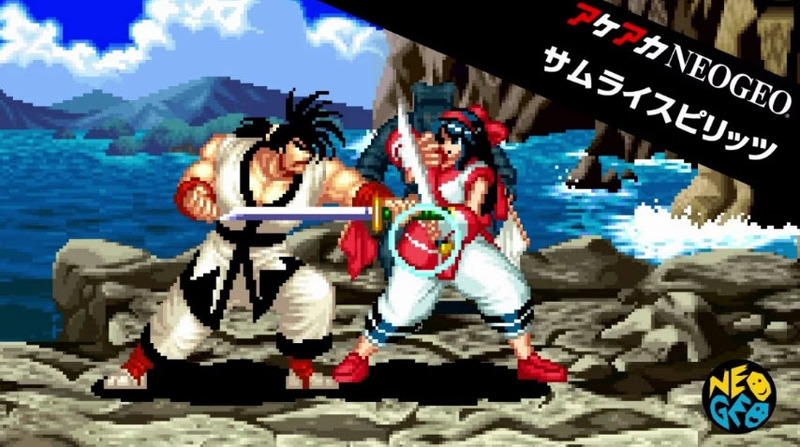 Night Warriors is one of our top picks for favorite fighting game on the Sega Saturn, thanks to its gorgeous animation, fun traditional 2-D gameplay and ridiculously cool character line-up. Where else will you find a cat lady, a succubus, a vampire, an abominable snowman, a rock-n-roll ghoul, an Egyptian mummy, a wolf man, a soul warrior and a Chinese goddess? And ones that play remarkably well, no less? C’mon, Ono, quit teasing and bring back the Darkstalkers already! When Street Fighter III initially came out, we liked it, but didn’t get into it as much as we did part two. But then came the Third Strike expansion, which introduced a number of new characters (including Chun Li! ), new parry and stun set-ups, and several other improvements. As a result, Third Strike became even more appreciated by the fighting community than either the original or Double Impact. The Street Fighter Anniversary Collection was a best-seller due to its inclusion, and we’re pretty sure that Street Fighter III: Third Strike Online Edition will sell equally well when it comes out next year. Bring the pain! When Samurai Shodown came out in 1993, it floored us. At the time of its release, we were already waist-deep in Street Fighter and Mortal Kombat territory, and yet here was a beautiful, original fighting game with the kind of tempo that only happens in real traditional samurai battles. It was absolutely amazing at that time, and still is today, 17 years later. The home versions weren’t so hot, as they mostly lacked the smooth scaling effect that the Neo-Geo version possessed (and the 3DO version lacked good controls, so go figure). Still, finding it in arcades shouldn’t be that big a problem. We know two places that carry it around here. And we stop by all the time. We had a tough time picking out a Street Fighter game for the number one spot. Alpha is a terrific game, and, for that matter, so is Super Street Fighter II Turbo and its HD Remix for Xbox Live and PlayStation Network. Still, back in 1991, when we were much younger and had more quarters than we knew what to do with, we turned to Street Fighter II, a game that pushed the fighting genre forward in ways we couldn’t possibly imagine. The game introduced a league of legendary warriors, all of whom turned out to be fun to play, from the husky Russian wrestler Zangief to the beautiful yet devastating Chun Li. The game became an instant phenomenon upon its release, gobbling millions of quarters and expanding a fighting community to epic heights. Even the glitches and the EGM Sheng Long April Fools joke got big-time notoriety. Today, it’s still a classic, and fans that still have their old SNES systems (or the Virtual Console) are finding time for a match or two. 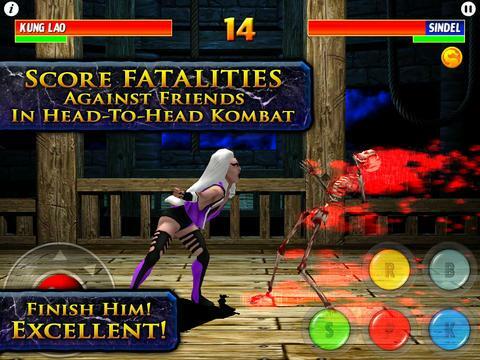 It’s on Xbox Live as well, although, let’s be honest, other Street Fighter games are keeping players busy on there. Hey, it’s a continuation of a long-running fighting legacy, so we’re sure Capcom doesn’t mind. Agree? Disagree? Let us know!